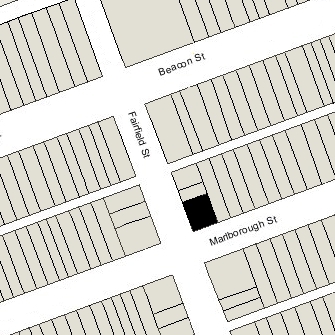 21 Fairfield is located on the NE corner of Marlborough and Fairfield, with 10 Fairfield to the north, 276 Marlborough (16 Fairfield) to the south, across Marlborough, 279 Marlborough to the east, and 5 Fairfield to the west, across Fairfield. 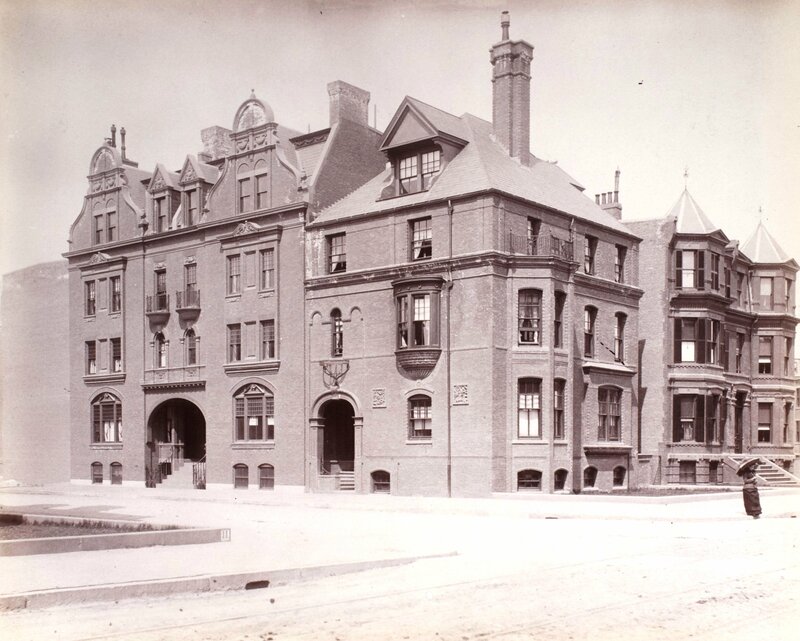 12 Fairfield was designed by Cabot and Chandler and built in 1879-1880 by Weston & Shepard and B. D. Whitcomb, builders, as the home of Miss Georgina Lowell. She is shown as the owner on the original building permit application, dated November 14, 1879. Click here for an index to the deeds for 12 Fairfield and for a plan of the original land. By 1890, Georgina Lowell had been joined at 12 Fairfield by Miss Susan Bartlett Cornish, who continued to live with her until her death in April of 1908. Miss Lowell continued to live at 12 Fairfield until her death in April of 1922. On November 6, 1922, the estate of Georgina Lowell transferred 12 Fairfield to her niece, Miss Ellen Wayles Coolidge. She previously had lived at 92 Marlborough. She also maintained a home in Cotuit. 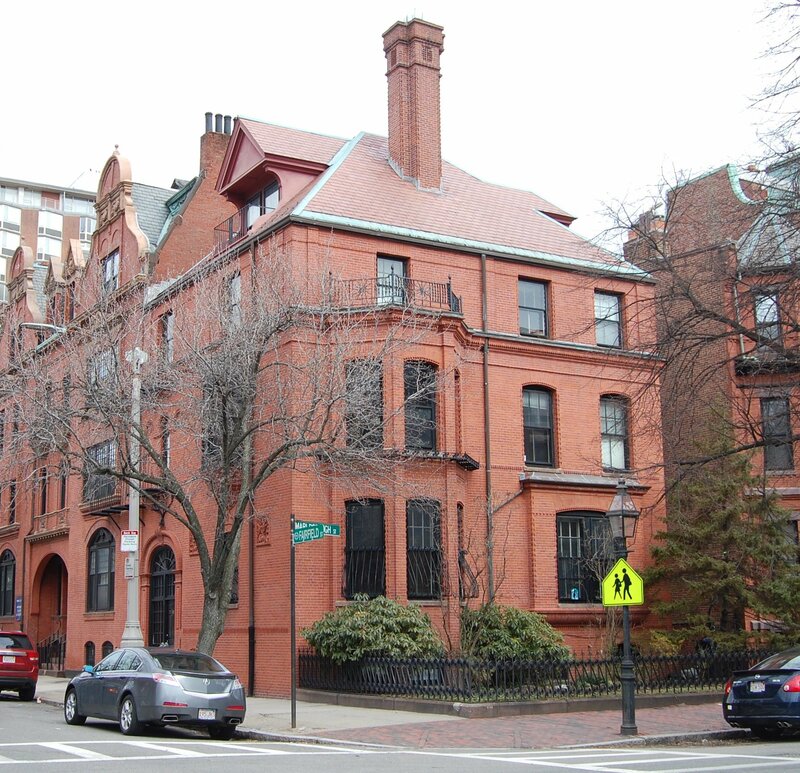 Ellen Coolidge was a leader in social welfare and settlement house work in Boston. She was joined at 12 Fairfield by Miss Lillie Marion Peck, also a social worker, who had lived with her at 92 Marlborough. She continued to live at 12 Fairfield until 1927, when she moved to 98 Pinckney. 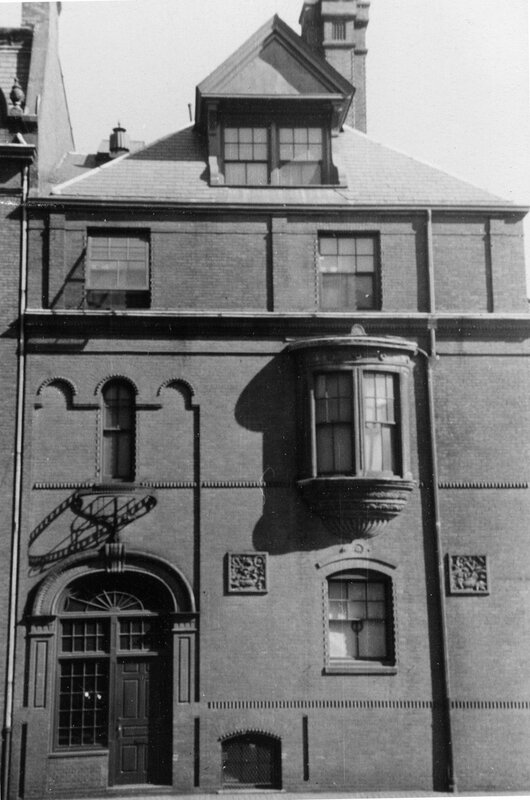 She was executive secretary of the Boston Social Union and by 1928 was living at the settlement house operated by the Union at 48 Rutland. In 1923, 12 Fairfield also briefly was the home of Francis Bacon Lothrop and his wife, Eleanor Abbott. They had married in April of 1922. 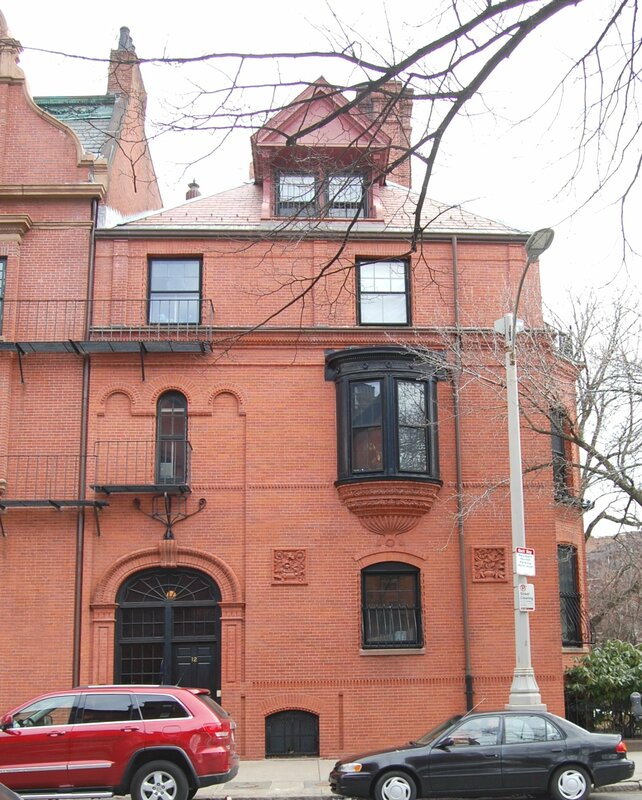 Prior to their marriage, he had lived at 114 Beacon with his mother, Alice Putnam (Bacon) Lothrop, the widow of William Sturgis Hooper Lothrop. By 1924, they had moved to 406 Beacon. In about 1925, Ellen Coolidge was joined at 12 Fairfield by her sister, Mary Lowell (Coolidge) Barton, widow of Frederick Otis Barton, and their surviving children: Frederick Otis Barton, Jr., Mary Lowell Barton, and Francis Lowell Barton They previously had lived at 68 Marlborough. By 1926, Otis Barton had moved to New York City. He would become an inventor and deep sea diver and is credited with designing the first bathysphere. In July of 1927, his sister, Mary Lowell Barton, married Edward Delos Churchill, a surgeon and professor of surgery. After their marriage, they lived at 67 Mount Vernon. 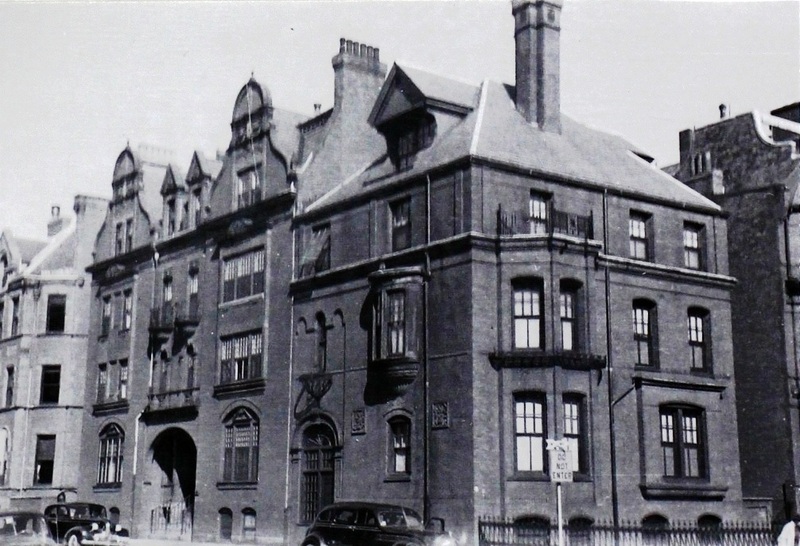 Mary Barton and Francis Barton continued to live at 12 Fairfield until about 1929, when they moved to New York City. In 1930, Ellen Coolidge was joined by Edward and Mary (Barton) Churchill. They continued to live at 12 Fairfield during the 1931-1932 winter season, but moved soon thereafter to Belmont. Ellen Coolidge appears to have been living elsewhere — probably traveling abroad, which she did frequently — and was not listed with the Churchills at 12 Fairfield the 1931 and 1932 Blue Books. 12 Fairfield was not listed in the 1933-1935 Boston Blue Books, and was shown as vacant in the 1933-1935 City directories. By 1936, Ellen Coolidge was living at 12 Fairfield once again. She continued to live there until about 1950. The house was shown as vacant in the 1951 City Directory. On September 6, 1950, 18 Fairfield was purchased from Ellen Coolidge by real estate dealer Paul Gerard Donahue. He also owned 10 Fairfield. In October of 1950, he filed for (and subsequently received) permission to convert 12 Fairfield from a single-family dwelling into a four-family dwelling. On December 31, 1953, Paul Donahue transferred 12 Fairfield to Marlboro Street Realty, Inc., of which he was the president. He transferred 10 Fairfield to it on the same day. On July 1,1976, 12 Fairfield was purchased from Marlboro Street Realty by Dr. Peter E. Pochi, a physician, and his wife, Barbara Pochi. On August 14, 1991, they transferred the property into Barbara Pochi’s name. On January 25, 1995, she transferred the property back into their joint names, and on the same day, they transferred a 40 percent interest to the Trustees of Boston University. On June 30, 1995, 12 Fairfield was purchased from the Pochis and Boston University by Dr. Peter M. Mauch, a physician and professor of radiation oncology at Harvard Medical School. In September of 1995. he applied for (and subsequently received) permission to convert the property from a four-family dwelling into a two-family dwelling. 12 Fairfield remained a two-family dwelling in 2015.